Summary Single bay entry-level NAS based on quad-core Realtek SOC with two USB 2.0 ports, one USB 3.0 port and single Gigabit Ethernet port. If you use the NAS Finder to search for single-bay NASes, you'll find that there are very few of them. Recently, I reviewed a new single-bay NAS, the Synology DS118. As I noted in that review, the market for single-bay NASes has pretty much dried up. It's not that single-bay NASes are bad, they just don't provide the fault tolerance that most NAS buyers want. Single disk devices, by definition, don't provide any fault tolerance. When the disk eventually dies, your data will be gone unless you have a backup. 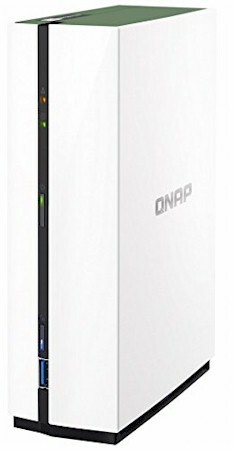 This review will focus on the QNAP's single-bay TS-128A. Like the DS118, the TS-128A also uses a quad-core Realtek processor, but a slightly different one. The TS-128A uses an RTD1295 where the DS118 uses an RTD1296. Both SoCs feature the same quad-core Cortex A53 processor running at the same clock rate. The main difference is that RTD1295 only has a single SATA port and a single USB 3.0 port while the RTD1296 has two USB 3.0 ports and two SATA channels. Both devices support two USB 2.0 ports, but Synology chose not to bring out the USB 2.0 ports on the DS118. The chart below, generated from the NAS Charts, shows the basic differences between the DS118 and the TS-128A. The major differences are the and number of USB ports. The Synology DS118 has two USB 3.0 ports; The QNAP TS128A has one USB 3.0 port and two USB 2.0 ports. Both NASes require case disassembly to install/change drives. Worthy of note - the installation of drives into the TS-128A, as well as the case disassembly, does not require tools. The callout chart below shows the front and rear panel layouts for the QNAP TSx28 series of NASes. The illustration is for the TS-228, but the indicators and port layout are the same for the TS-128A. The rear panel has the two USB 2.0 ports and the single Gigabit LAN port. The front panel has a LAN LED indicator an LED for the single drive, the single USB 3.0 port, the power switch and a One Touch Copy button for easy transfer of files to the NAS. The image below shows the top side of the main board for the TS-128A. The large heatsink covers the RTD1295 processor. The image below shows the bottom side of the main board for the TS-128A, with the drive "bay"/bracket. The black connector at top right of the photo is likely used to connect to a backplane board to support a second drive in the TS-228A. The table below shows the key component summary for the TS-128A and Synology DS118. The QNAP TS-128A drew 7 W with one of our stock WD Red 1 TB (WD10EFRX) drives spun up and 5 W in power save mode with the drive spun down. Fan and drive noise was rated very low for both NASes.